Clacton-on-Sea – Since 1968 Pickering Electronics are Manufacturers of high quality Reed Relays for Instrumentation and Automatic Test Equipment (ATE), High voltage switching, Low thermal EMF, Direct drive from CMOS, RF switching and other specialist applications. Relays are available in Surface Mount, Single-in-Line (SIL), Dual-in-Line (DIL) and many other popular package styles. The SERIES 104 fits on a Board area of 0.25 x 1.0 inches (1 Form A) They are available up to 3 Kilovolts with Rhodium plated, vacuum switches in a Single-in-Line plastic package. Three voltage ratings are available. 1kV stand-off, 500 volts switching at 10 Watts (One or two Form A or one Form B). 1.5kV stand-off, 1kV switching at 10 Watts (One or two Form A or one Form B). 3kV stand-off, 1kV switching at up to 20 Watts (One Form A only). Like all of our Single-In-Line Series they are constructed using our SoftCenter™ technology. These are available up to 15 Kilovolts with Tungsten plated, vacuum switches. Series 60 are for chassis mounting with solder tag connections, Series 65 are for PCB mounting. Three voltage ratings are available. 5kV stand-off, 3.5kV switching at 50 Watts (One Form A or one Form B). 10kV stand-off, 7.5kV switching at 50 Watts (One Form A or one Form B). 15kV stand-off, 12.5kV switching at up to 50 Watts (One Form A only). The Reed RelayMate from Pickering Electronics is a publication which looks in detail at reed relays. In it you’ll find out how reed relays are constructed, what types there are, how they work, what parameters affect their operation, how to choose the correct relay, a comparison with other relay technologies and how to drive and place reed relay coils. The Reed RelayMate is available free from the home page of Pickering Electronics’ website and is available in either hard copy or pdf format. We will also have copies available free of charge at the show. Pickering Electronics was formed in 1968 to design and manufacture high quality reed relays, intended principally for use in instrumentation and automatic test equipment. 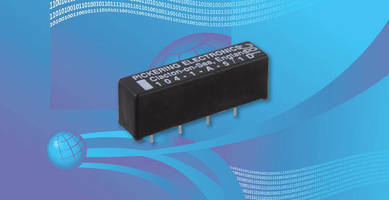 Pickering Electronics offer an extensive range of high quality instrumentation grade reed relays designed for applications requiring the highest levels of performance and reliability. Through the experience of supporting the most demanding manufacturers of large ATE systems with high relay counts Pickering has refined its design, assembly and quality control methods to optimise its product range to this most challenging market.